What is LIC Navjeevan plan all about? What are its salient features? How this can benefit investors? Is it worth investing in LIC Navjeevan Plan? Should you invest in LIC Navjeevan Plan or is there any better alternate to this? 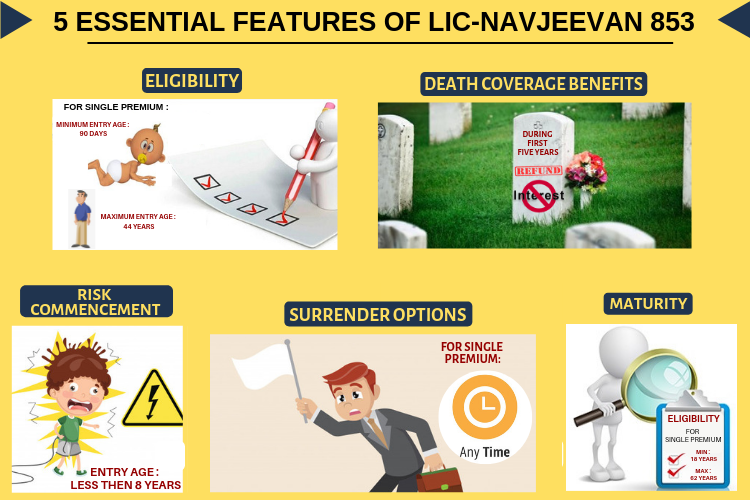 What is LIC Navjeevan Plan all about? LIC Navjeevan 853 is the new insurance plan by LIC unveiled on 18 March, 2019. Ever since the launch on, there has been much hype about the LIC’s Navjeevan 853. Apart from life insurance coverage, this new policy is also seen as a tax-saving investment instrument. It is a non-linked, with profit endowment plan. A non-linked insurance plan means it is not linked to the stock market or mutual funds ergo risk factor is not a concern. Also, at the time of maturity the holder will receive an assured sum along with the Loyalty Addition. In case of death of the life insured while the plan is in-force, the nominee will receive the sum assured on death. Read everything about LIC’s Navjeevan Plan 853 in the simplest form below to make a clearheaded decision. Let us see the basic features of the LIC’s Navjeevan 853 down below before going into the other essential features and conditions. LIC’s Navjeevan insurance plan no.853 is available effective 18th March, 2019. It is also available to buy on both offline as well as online platform. i)	There is a 2% discount for the Single Premium policy when bought online. ii)	There is a total of 5% discount for the Limited Premium Navjeevan 853 policy when bought online. The policy term available for the LIC’s Navjeevan 853 insurance starts with a minimum term of 10 years to a maximum of 18 years. This mode of payment is the method of paying the premium as a one-time lump sum amount. In this mode, the premium for the selected Basic Sum Assured can be paid in instalments over a course of 5 years. The available instalment options are monthly, quarterly, half-yearly and annual payments. The basic sum assured is the amount receivable at the maturity of the insurance plan excluding the loyalty benefits. The Navjeevan 853 insurance plan will require the insured to choose a minimum of ₹100,000 as basic sum assured. LIC has not assigned any maximum limit on basic sum assured in the Navjeevan 853 plan. However, there are a couple of conditions on regarding the maximum limit. i)	Basic Sum Assured chosen between ₹1 lakh to ₹9 lakh should be in multiples of ₹20,000. ii)	Basic Sum Assured chosen above ₹9 lakh to unlimited amount should be in multiples of ₹50,000. For a person to be eligible for the LIC’s Navjeevan 853 plan, at least one of the following conditions must be satisfied. i)	A minimum entry age of at least 90 days should have been completed. ii)	The maximum entry age is set at 44 years (nearest birthday) of age. 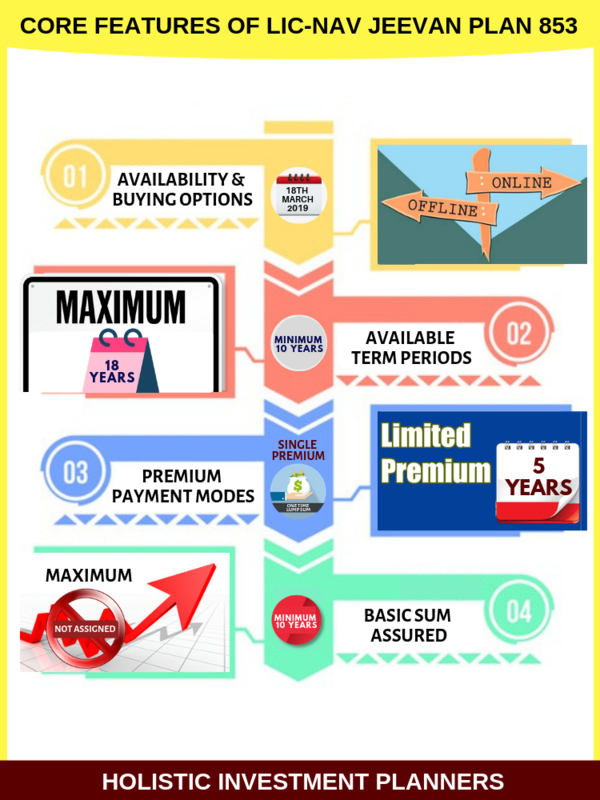 The eligibility for 5-year limited premium is classified into Option 1 and Option 2. A minimum entry age of 90 days should have been completed. The maximum entry age is set at 65 years (nearest age) of age. The choice of ‘option’ while buying the Navjeevan 853 policy will influence the Sum Assured at Death under death coverage benefits. In this Navjeevan 853 policy, if the entry age is less than 8 years the risk will be commenced only under specified condition. i)	One day before completion of two years of the policy. ii)	One day before the policy anniversary, in case 8 years of age is reached after the buying of policy. The risk will commence on the first occurrence of either of these two conditions. On the event of maturity of the Navjeevan 853 insurance policy, the insured is eligible for maturity benefits. The maturity benefits include the Basic Sum Assured and Loyalty Addition (If any). The said maturity benefits are paid on the condition that all the due premiums have been paid. A minimum of 18 years of age should have been completed to be eligible for the maturity benefits. A maximum of up to 62 years (nearest birthday) is allowed to be eligible for the maturity benefits. Under Option 2: A maximum of up to 80 years (nearest birthday) of age is allowed to be eligible for the maturity benefits. In the LIC’s Navjeevan 853, in case of the death of the life insured before the maturity date, while the policy is still active, death coverage will be paid under two criteria. i)	If the event of death occurs during the first 5 years, starting from the date of commencement of risk, the nominee shall receive the death coverage benefits. ii)	Death Coverage Benefit: Refund of the premiums paid, without any interest. i)	If the event of death occurs after the first 5 years, the nominee shall receive the following benefits. ii)	Death Coverage Benefit: Sum Assured at Death with the Loyalty Addition (if any). What is Sum Assured at Death in Navjeevan Policy? It is the sum receivable by the nominee at the event of death of the life assured. The higher of the two available sum will be payable as the Sum Assured at Death. Absolute Amount Assured: 10 times of tabular Single Premium for chosen ‘Basic Sum Assured’. Basic Sum Assured by the policy on maturity. i)	10 times of Annualised premium if the policy bought under ‘Option 1’. ii)	7 times of Annualised premium if the policy is bought under ‘Option 2’. The policy can be surrendered at anytime during the policy term. The Navjeevan 853 policy can be surrendered anytime after paying the premium for at least two years. i)	Navjeevan 853 gives 15 days grace period for the monthly premium payment mode. ii)	30 days (one calendar month) of grace period for quarterly, half-yearly and yearly premium payment modes. i)	The LIC’s Navjeevan 853 policy can be revived within 2 years of the First Unpaid Premium (FUP). i)	Loan can be availed after 3 months of issue of the LIC Navjeevan policy. ii)	The maximum loan that can be claimed is 80% of the surrender value. i)	Loan can be availed after 2 years of the issue of the LIC Navjeevan policy. iii)	The maximum loan that can be claimed is 70% of the surrender value for paid-up policies. i)	Backdating is allowed within the same financial year of the issue of the LIC Navjeevan policy. i)	Income Tax rebate can be claimed under section 80C for the premium paid in a financial year less than or equal to 20% of the Basic Sum Assured. i)	The Navjeevan 853 policy also provides an optional Accidental Death and Disability Benefit Rider. ii)	In case of death, along with the Sum Assured at Death, Accident Benefit Rider Sum will also be payable. iii)	A maximum of amount equal to Sum Assured at Death can be availed as Accident Benefit Sum Assured. i)	Maturity benefit or the Death benefit can be received in instalments instead of lump sum. ii)	Period of 5, 10 and 15 years term instalment options are available with the Navjeevan 853.
iii)	Under instalment settlement option, the minimum settled amount shall be ₹50000, ₹25000, ₹15000, ₹5000 for the yearly, half-yearly, quarterly and monthly instalment modes. i)	The LIC’s Navjeevan 853 policy also has a free look period of 15 days from the date of issue of policy. 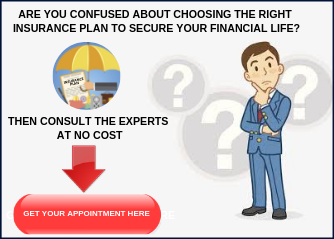 ii)	However, this free look feature is an already existing feature to all the insurance policies. iii)	IRDA made the 15 days free look period mandatory for all the insurance policies to avoid any mis-selling of insurance policies. 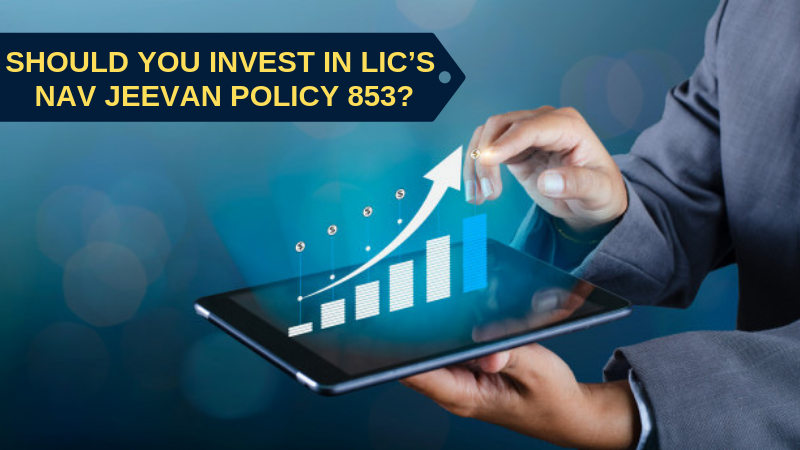 SHOULD YOU INVEST IN LIC’s NAVJEEVAN POLICY 853? Have you read all the Navjeevan 853 policy features, benefits and the conditions attached to it? Should you invest? Or are there better options available? The LIC’s Navjeevan 853 insurance policy really has some first time features that other life insurance policies do not have. In addition to the life coverage, the tax saving option is another major reason for people to go for LIC’s Navjeevan 853 policy. However, when considering the long term returns in such policies, Navjeevan 853 is not impressive in any terms. Let’s say you are buying the limited premium Navjeevan 853 insurance plan with the following assumptions. Choosing the yearly premium payment mode for Basic Sum Assured of ₹5 lakh would be the best option to cut on income tax (at least that is the mainstream idea). I am also assuming entry age as 25 years, because lesser the age, lesser will be the insurance premium. An expected return of approximately 6% for a long term period of 18 years is never a go-to option in any place of the world. The expected maturity value is Rs.12.29 Lacs from Navjeevan Policy. If life insurance is your major concern, you can always opt for a term insurance. The naming of insurance policies as an investment option is only an act of pushing the product into the market. Experts recommend individuals to keep the investments and insurance in separate pockets. It is because insurance policies can never be an investment. It would be an exaggeration to even call it a savings instrument. Instead of “investing” in LIC’s Navjeevan 853 policy or such endowment plan buy a term insurance policy and invest the balance in PPF. The table below illustrates how you can get insured and generate a higher return with the same amount. Investing the difference amount, after paying the annual term insurance premium, in PPF account would amount to more than ₹16.11 lakh in o18 years at 8% interest rate. Remember, you are also covered for ₹25 lakhs of life insurance at the same time for the same amount. If you are a person familiar with taking calculated risks, you can invest the same difference amount in equity mutual funds as SIP. Equity mutual fund SIPs offer an expected return of 12%, which is literally 200% higher than what Navjeevan 853 plan offers. By investing the same money in a combination of term insurance and equity mutual fund sip will give an expected value of Rs.26.59 lacs (after tax) at the end of 18 years along with 25 lacs life cover. Introducing a new endowment insurance plan every year is nothing more than a selling strategy. It is a product targeted at salaried employees in the name of tax-saving. Ultimately, LIC’s Navjeevan 853 is the same old product in a different new wrapper. If you are a risk-averse investor, you can choose to invest in term insurance + PPF combination. If you are comfortable taking risk, you can choose to invest in term insurance + Equity Mutual Fund SIP combination. Equity funds deliver much better returns for all long term investments. Next Next post: 7 reasons: Why is it worth to hire a financial planner?